The typical workweek for AEON teachers is Tuesday through Saturday. Teachers will teach an average of five to seven classes a day with the first lesson of the day starting at 12:00 p.m. Teachers and staff generally arrive at the school at 11:45 a.m. to ensure that the school is up and running before the start of the business day. There is a five-minute meeting at the start of every day, which gives the manager an opportunity to go over the previous day’s business results and the current day’s schedule with the teachers and staff. In the early afternoon, the student body is generally made up of children, retirees, homemakers and college students. There tend to be a greater number of kids classes and private lessons during this time. Before kids classes, the teachers do kids lobby talk, which can involve playing with puppets or reading story books. Teachers also spend this time to check the children’s home study tests. After each kids class, the teacher will do a class review for the parents in the lobby. Teachers also do model lessons for children who are interested in joining AEON. Additionally, teachers assist in other office duties such as helping with local advertising, which usually consists of folding or stapling flyers and handing them out on the street. Teachers receive a one-hour break each day. Where break times fall during the day will vary throughout the week, so it is important for teachers to be flexible with their eating habits. The evening is generally the busiest time at the school. Teachers spend time in between classes doing lobby talk and/or conducting check tests to ensure that students are able to complete their Self-Study materials. Teachers may also hold short educational counseling sessions with their adult students or do interviews for prospective students. The last lesson of the day ends at 9:00 p.m. Teachers see their students off and have time to get prepared for the next day. 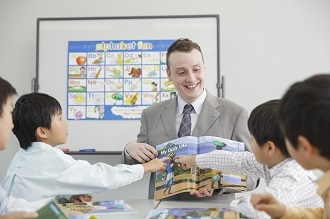 Teachers enjoy their various responsibilities from teaching to business to interacting with all students. A typical day at AEON is fast-paced and fun-filled. It also requires good time-management skills and flexibility.